Smart is an apt handle for SoC technology that is changing how digital signage is being operated. SoC, short for System-on-Chip, is the technology that integrates all key computer components into one little compact board. This means that the kind of computing horsepower and gear that used to be contained in boxy personal computers is now small enough to be built right inside devices. 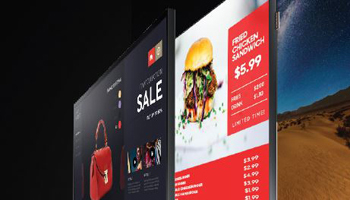 As a result, commercial display panels with embedded SoC technology can now be used as digital signage media players, negating the need for external players. This removes cost and complexity, and simplifies the operation of digital signage networks. Samsung pioneered SoC displays five years ago with the Samsung Smart Signage Platform. Since then, they’ve fully invested in SoC technology — with SoC standard across almost all digital signage products, from the smallest to the largest displays. Learn about the cost savings achieved through Samsung's Smart Signage Platform in this white paper. Displays with SoC technology are a smart option for many end users — with the benefits outlined in a recent study on the total cost of ownership (TCO) advantage of Smart Signage. Here’s what the calculations determined: Costs on different types of typical digital signage jobs could be trimmed by 10-41 percent using SoC displays instead of setups with separate digital signage media players. Hardware costs: Smart commercial displays ship with the media player built in, whereas separate media players add additional costs, not to mention additional cables that have to be connected, strapped in place and hidden. It’s possible to use very, very basic micro PCs that cost less than $100, but the sorts of PCs used for most digital signage projects these days cost, on average, $330. Installation costs: Installation crews work off time clocks, and the universal metric is that the longer it takes to do something, the more it’s going to cost. A conventional digital signage setup requires a separate PC, with power, signal and possible internet connectivity cables, while a “smart” display is self-contained — with just a lone power cord. The TCO analysis estimated a typical smart display installation required 30 fewer minutes to complete, because it just needs to be fitted in place, plugged in and connected to Wi-Fi. There are also potential savings in cases where the digital signage project only required the HTML5 web browser capability built into the SoCs, negating the need for costly third-party software licensing. There are also other hidden savings when smart displays are used. Solution providers using Samsung’s smart displays report how their field servicing costs have dropped through the floor, because once-complicated remote fixes are now resolved by powering the TV off and then back on using the provided remote control — something that most people at an installed site can figure out. But when a signage network is running off a PC, it often needs a keyboard and mouse plugged in, and even special remote computer access software. It’s rare when someone at the site has the technical skills, or time, to help out to that degree. Being able to resolve problems that simply can save hundreds of dollars otherwise spent sending a skilled service technician to the installation site. Manufacturers concede that the early versions of smart displays had limited power and capabilities, but all that’s changed. The latest generations of smart displays leverage the same technologies going into some of the latest smartphones. Some digital signage software company leaders are now saying that certain SoC displays meet or beat the capabilities of their “go to” PC-based media players. The early adopters of SoC have been fast food restaurant operators, as well as retailers and marketers who see the business benefits of replacing printed material with digital versions. In a quick service restaurant environment, thin, light and almost cord-free SoC displays are replacing printed menu boards above and behind order counters. Digital displays allow operators to change featured items and prices by time of day, and also make revisions in a matter of minutes, instead of the days or weeks needed to get new print material produced and delivered. SoC technology has evolved and grown in capabilities, but there are still jobs where a particularly power PC — more than the $300+ ones — makes more sense. That most often applies when the content is graphically intense and needs specialty hardware, or when the client wants a big, multiscreen, ultra-resolution videowall. However, for most conventional digital signage requirements, displays with SoC technology have the smarts and power to get the job done. Digital signage can provide a new level of customer interaction and engagement for your enterprise.